Let's begin with the ever elusive question: what does a PI do? Plenty of people view the PI profession as mysterious and elusive, and those who have particular interest in joining the field usually just want straightforward answers to two main questions: what does a PI do, and how do I become a PI? These are not unreasonable questions by any means, and it's not all that surprising that these individuals turn to the many Q&A sites and forums on the web for answers. For every person searching the web for answers there are plenty more who either a) think they know what a PI does, b) like to pretend they know what a PI does, or c) take the opportunity to show how clever they are. And so, we introduce you to trolling: the act of scouring online chats, blogs, comments, and other social forums for the perfect opportunity to post an off-color, irrelevant, and sometimes obnoxious joking response. We made the rounds on the Q&A sites of the web and bring you the dumbest, funniest, silliest, and all-around outrageous explanations of what a PI does. 1. We don't know what's worse: the fact that two people actually thought this was clever or the fact that these answers appeared one right after the other . . .
2. A Magnum P.I. reference? We're shocked, absolutely shocked! 3. Really? You don't say! 4. Ah . . . well, thank you. That really clears things up! 5. 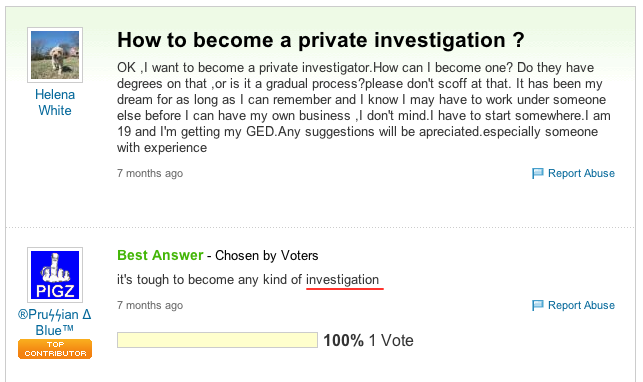 A valiant effort, but we're pretty sure that's not WHY they're called private investigators. 6. Well someone's a little bitter . . .
Now that we have a clear understanding of what a PI does, let's move on to the next question: How do I Become a PI? You get the idea. 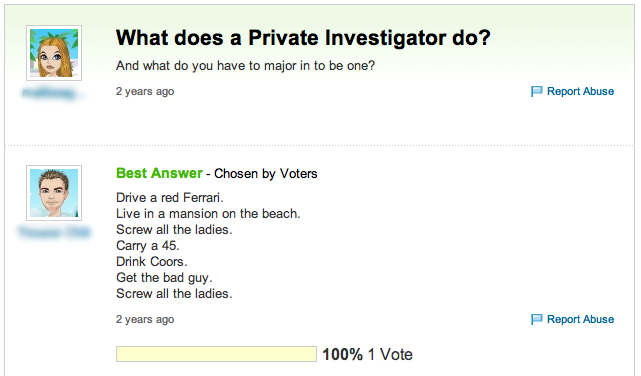 We've been catching people trolling the web to post "funny" responses to questions about a career as an investigator. Though we've already proven that there are plenty of people with a solid understanding of what a PI does, let's take a moment to explore the best and worst trolls in answering the question how do I become a PI? 1. It was probably unintentional, but light Facebook stalking can actually be a helpful tool in the skip tracing and people locate skillset. So, fair point. 2. It's certainly an inventive approach. 3. Again, with the Magnum PI references. 4. We're going to go out on a limb and say that this answerer was probably on the younger side. 5. Let's be 100% honest here . . . we don't get it. 8. Simple and straightforward. Though a bit vague . . .
9. Hey look everyone, a Sherlock Holmes reference! Bet you didn't see that one coming! (We have to agree with the asker's response on this one). 10. It's safe to say we're speaking for all of the ladies out there when we say ouch. 11. Turns out grammar does matter. 12. Kind of a roundabout way to go about it, don't you think? 13. Classic film, yes, but a "bumbling" and "inept" PI might not be the best role model. 14. Let's just go ahead and give this one an A+ for creativity. #15 And the grand finale . . . Want to know how to become a PI? This is the answer that really says it all. Sure, it's a little harsh, but it's also the most useful answer yet. It's snarky and sarcastic, but the actual how-to is hidden behind all that sass. And there you have it. Even the private investigation industry is not immune to internet trolling. Head to the PInow Facebook page to join other investigators in commenting on headline news, sharing tips, exchanging jokes and laughs, and more. Connect with PInow on Facebook!